Dr. Sean McGrath (Department of Philosophy and director of For A New Earth) will moderate with Dr. Barbara Neis (Department of Sociology), Dr. James Feehan (Department of Economics) and Dr. Bill Montevecchi (Ocean Sciences) presenting. An open discussion will follow the presentations. 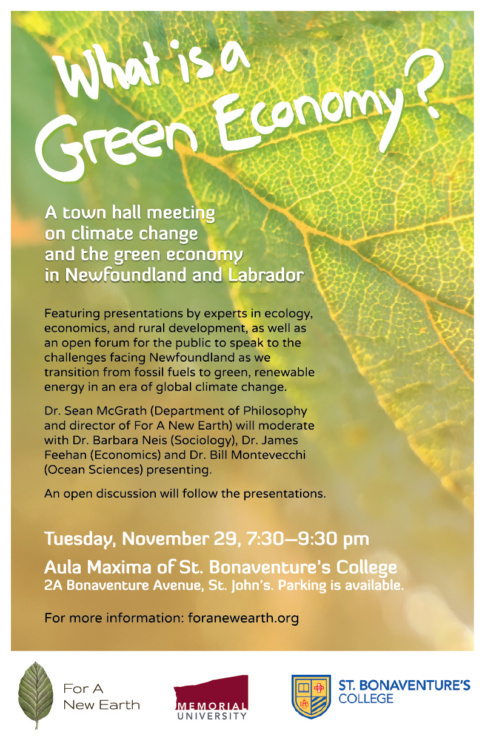 The event is designed to foster a greater dialogue among all interested parties and stakeholders concerned with the greening of the economy of Newfoundland and Labrador and is intended to create greater public awareness of the social, political and ecological complexity of renewable energy and resource development in the province. Among the questions addressed will be: What exactly is a green economy? Who is best served by it? Who are the stakeholders in the inevitable transition from fossil fuels to renewables? What role will there be in the green economy for rural communities? How much energy do we need, and why? What is a Green Economy? will be held in the historic Aula Maxima of St. Bonaventure’s College, 2 Bonaventure Avenue, St. John’s. Parking is available. For more information, please contact Dr. Sean McGrath at 709-746-3897 or email sjoseph.mcgrath@gmail.com. On November 29, 2016, Memorial University of Newfoundland, with the support of St. Bonaventure’s College, and facilitated by For A New Earth, hosted a town hall meeting on the theme “What is a Green Economy?” The two-hour event featured presentations by experts in ecology, economics, and rural development, as well as an open forum for members of the general public to speak to the challenges facing the province as it transitions from fossil fuels to green, renewable energy in an era of global climate change. This entry was posted in events, green economy, meetings and tagged Climate Change. Bookmark the permalink.